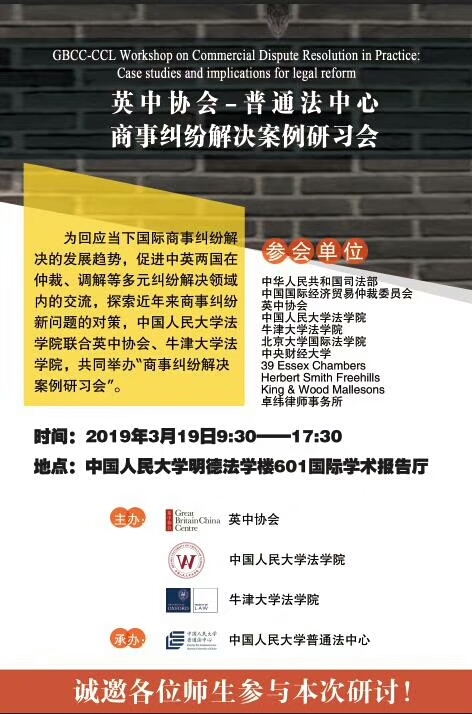 On Tuesday 18 March 2019, the Great Britain-China Centre and the Centre for Common Law at Renmin University of China held an interactive workshop on Chinese commercial dispute resolution (CDR) in practice. The workshop brought together a select group of experienced international and Chinese practitioners, policy-makers and academics to discuss topical issues in the evolving legal framework for CDR in China. Expert participants utilised several recent Chinese cases that highlighted complex issues in CDR, including cross-border insolvency, admissibility of evidence and overlapping jurisdiction. They also took part in a mock mediation session for a representative Belt and Road Initiative (BRI) case. The workshop’s interactive format enabled forthright discussion on typical challenges in delivering effective CDR, and identified potential solutions and opportunities for future research, policy and learning collaborations. 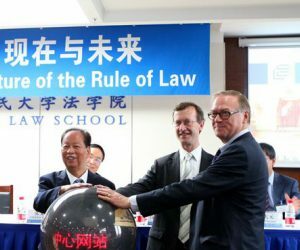 The Centre for Common Law (CCL) is a partnership established in 2014 between Renmin University Law School, GBCC and the University of Oxford Faculty of Law. Maureen O’Neill, Oxford Faculty of Law’s director of development, opened the workshop and expressed continuing support for strengthened cooperation. The CCL serves as a platform to bring together influential experts from academic, policy and practitioners background to advance understanding of topical issues related to common law. This latest workshop is part of an ongoing programme to share UK legal expertise and best practice to support China’s ambitious CDR reforms, funded by the UK Government’s Prosperity Fund China rule of law for business programme. Speakers during the workshop included Adrian Hughes QC, barrister at 39 Essex Chambers; Dr HONG Ying, research fellow of the Chinese Ministry of Justice’s Judicial Research Institute; Dr LI Hu, deputy secretary-general of CIETAC; Susan Finder, distinguished scholar in residence at the Peking University School of Transnational Law; Dr LI Li and John YE, partners at Chance Bridge Partners; Ms Meg Utterback, Partner, KWM; Dr Mimi ZOU, Fangda career development fellow in Chinese commercial law at St Hugh's College, Oxford; and Helen TANG, partner, and Anita Phillips, professional support consultant, from Herbert Smith Freehills. Adrian Hughes QC framed the day’s discussions with an overview of recent significant developments in CDR in the UK. He commented that the new Singapore Mediation Convention is likely to strengthen the role of mediation, and identified this as particularly important for international investments and the BRI. Dr HONG Ying provided an overview of recent institutional reforms at China’s Ministry of Justice and its increased responsibility for overseeing China’s CDR policy. Case studies, presented by experienced practitioners and legal experts involved in similar cases, brought issues to attention that lawyers, arbitrators and judges frequently navigate in disputes, especially those involving foreign parties and cross-border elements. Such disputes involving Chinese parties are increasing, and international and Chinese practitioners and policy-makers alike need an enhanced understanding of the complex, interlocking issues involved. The case study discussion format proved an effective way to substantively discuss several of these issues. Experts highlighted key areas in which they support changes in legal practice. These included cross-border insolvency proceedings in relation to China’s Bankruptcy Law, which currently prioritises domestic Chinese creditors over creditors undertaking proceedings in other jurisdictions; and procedural issues relating to evidence in arbitration and litigation, emphasising the need for strict procedures to ensure fairness, efficiency and effectiveness for the admissibility of evidence. Overlapping jurisdiction was identified as a significant issue that needed to be mitigated in order to avoid parallel proceedings, with experts noting effects on the enforcement and recognition of foreign judgments. Participants also discussed China’s signing of the Hague Choice of Court Convention in 2017, and the alignment of the country’s law with the convention for ratification. Concluding the workshop, experts undertook a mock mediation on a typical dispute relating to a fictional Chinese company’s BRI infrastructure investment in a third country. The simulation, led by experienced HSF lawyers Helen Tang and Anita Phillips, provided a valuable insight into mediation in practice, enabling the international and Chinese experts to compare and contrast approaches. GBCC thanks the British, international and Chinese experts who participated in the workshop. We look forward to continuing cooperation with the Centre for Common Law and UK and Chinese partner organisations to increase legal certainty for business and strengthen the rule of law. For more a more detailed summary of the sessions, please see the report below. The new Singapore Mediation Convention should provide increased certainty for the enforcement of cross-border mediation settlements. It will give similar status and enforceability to mediation settlements as the New York Convention on the Recognition and Enforcement of Foreign Arbitration Awards gives to arbitration awards. This development is likely to lead to an enhanced emphasis on mediation to resolve commercial disputes, and may be particularly useful in the context of some BRI disputes. Recent institutional reforms within China’s Ministry of Justice (MoJ) included the merger of the former State Council Legislative Affair’s Office into the MoJ. These organisational changes are aimed at strengthening China’s ability to meet changes in the international CDR landscape and put forward new proposals to meet demand in the CDR space. The MoJ has also undertaken significant work in relation to the 2018 ‘Opinion Concerning the Establishment of the Belt and Road International Commercial Dispute Resolution Mechanism and Institutions’ (Chinese here, English here), and is involved in the development of a new ADR institution for BRI disputes. The number of cases and the value of the cases heard by CIETAC has increased sharply. Between 2010 and 2018, the total number of cases rose from 1352 to 2962, including several hundred BRI cases in recent years. Total disputed amounts rose from CNY 13.8 billion to CNY 101.5 billion during this timeframe (approximately USD2 billion to USD 15 billion – see original Chinese article with full statistics here). As part of a push to “go global”, CIETAC recently opened a new Vienna representative office to accompany existing offices in Hong Kong and Vancouver. Effective bankruptcy regimes are integral to a strong business environment. Uniform treatment should be maintained for all parties regardless of jurisdiction or national origin in accordance with the principles of the rule of law, as opposed to insolvency regimes that place the interests of some creditors ahead of others. Article 5 of China's Bankruptcy Law acknowledges foreign bankruptcy proceedings, but gives Chinese courts the power to prioritise the claims of Chinese creditors first, after which foreign bankruptcy proceedings may be acknowledged. Recently, Chinese courts reportedly very nearly recognised a major foreign bankruptcy proceeding, but the proceeding was withdrawn before this could take place. In relation to future steps that China may take in strengthening recognition of cross-border bankruptcy proceedings, participants suggested that China is more likely to enter into a number of bilateral treaties for mutual recognition, rather than sign up to multilateral instruments. Applicants and respondents often dispute which party should submit evidence first. This can make it very difficult to develop a schedule for submission of evidence that is fair to all parties. The onus should be on the party that bears the burden of proof to provide evidence first. If tribunals take positions on exchange of evidence and set up procedures to ensure that disclosure can take place effectively and efficiently, they give predictability and clarity to proceedings. Judges sometimes penalise parties for late submission of evidence in bad faith, but this may not be a sufficient deterrent if the evidence can still be used. Strict application of procedures is required in order to ensure exchanges of evidence are effective and fair to all sides. A defined schedule also avoids situations where evidence is initially submitted very slowly, followed by a large amount of evidence being submitted tactically at the eleventh-hour to disrupt proceedings. Both parties should act in good faith, but there are practical difficulties in preventing behavioural infractions by opposing parties in long proceedings, particularly in relation to witnesses. Witness testimony has conventionally been considered less important than documentary evidence in Chinese cases, but arbitrators in China are increasingly utilising English style adversarial cross-examination. In relation to cross-examination, different jurisdictions have different ethical requirements and understandings of legitimate conduct in relation to witness coaching. Participants reflected that English lawyers are under much more stringent obligations in relation to cross-examinations than American lawyers, who are able to coach witnesses. Procedural and cultural gaps are narrowing between civil and common law jurisdictions in several areas. In some instances, courts and arbitration institutions are becoming more culturally attuned. In a recent case given as an example, an English court dealt particularly sensitively with a Chinese witness unfamiliar with the cross-examination process, rather than allowing the individual to flounder in a scenario they were unaccustomed with. New initiatives may indicate that the gap between the procedures of UK and Chinese judicial and arbitration institutions are narrowing to an extent. Changes to the disclosure process are currently being trialled in the English justice system. The Disclosure Pilot for the Business and Property Courts, in which disclosure requirements are less expansive than previously, commenced in January 2019 (more information here). In addition, the new Prague Rules on the Efficient Conduct of Proceedings in International Arbitration, drawn up by practitioners from over two-dozen countries, also aim to give a civil law “flavour” to international arbitration proceedings (more information here). Articles 25 and 34 of China’s Civil Procedure Law gives the country’s courts exclusive jurisdiction in many cases (see legislation in English here). 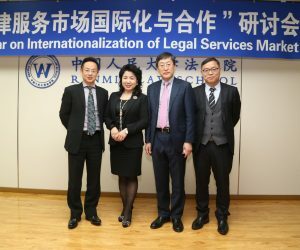 This approach contrasts with jurisdictions that have implemented or already aligned with the Hague Choice of Court Convention, and increases the likelihood of jurisdictional disputes and parallel proceedings taking place within China and in other jurisdictions. China may yet ratify and implement the Hague Convention, which it signed in 2017. Some experts predicted that China would implement the agreement in a two-tiered manner, in which countries that have signed and ratified the Convention would receive treatment as per the convention, while those that had not ratified would be subject to the current exclusive jurisdiction stipulations of Article 34. Forged documents can be used as a tactic to draw opposing parties into proceedings in Chinese courts. During initial proceedings, authenticity of the documents used as a basis for jurisdiction is not examined as they are viewed as a substantive law matter. This means that parties may be drawn into costly proceedings in China under exclusive jurisdiction rules, but if documents have been forged, this will not be discovered until much later in costly and lengthy court proceedings.